This hanging keepsake is a reminder of a special event - like a first Christmas, a new baby or a celebration day. 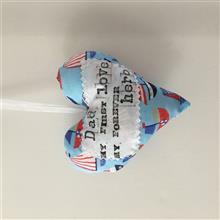 The text on the hearts are as on the pictures, please select the fabric print to order your heart. NB. please note that this is for decorative purposes only and not a toy. These items are handmade and ready made.